It's that time of the month where the new box is what everyone is posting about. 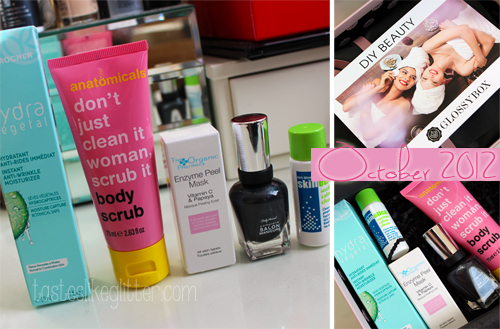 This month is the 'DIY beauty' box* full of pampering goodies. I swear each box contains some form of anti aging product. I don't tend to use them yet but this is really nice and has a light fresh fragrance. It melts into the skin easily and leaves it super moisturised. It contains hyaluronic acid to immediately reduce the appearance of wrinkles. I applied this to one hand and wrist. It left it a lot plumper and the lines in the back of my hand are barely noticeable. I usually use salt/sugar body scrubs so this is a nice change. It's a delightful smelling pink grapefruit scrub. I was expecting this to be a cream but it's actually a clear gel like texture. It contains ground walnut shell to rid your body of dead skin and leave it super smooth. I really like the packaging of this and it's a really good price. I've never used an enzyme peel before. Firstly it smells amazing, really yummy! It's a thick cream that you apply to the face, neck and back of your hands (if you so wish). It has a very very slight tingling sensation once on the skin. After 10 minutes you take it off with a damp muslin cloth. I can't say I noticed much of a difference in my skin once washed off. Though I think masks tend to have an effect after regular usage. This couldn't have come at a more perfect time. I have been loving really dark nails, I've been wearing black for the last week. This is dubbed as a dupe for Chanel's Black Pearl, I wouldn't say they're identical though. It's a metallic gunmetal with very fine microshimmer. It has a very silvery/blue shift to it. It goes on easily and opaque in 2 thin coats. I am currently loving this. It's a very natural product for clearing blemishes that claims to have no side effects. I always find spot clearing products are extremely drying but this contains just 4 ingredients. It's super easy to apply, just saturate a cotton ball, wipe over the skin and let it air dry, then apply moisturiser/makeup like normal. It claims to work for 12 hours. If this happens to help my skin I will most definitely be buying the full size. Fingers crossed. I surprisingly really liked this box and can see myself using everything. Though I only managed one use of out the mask.